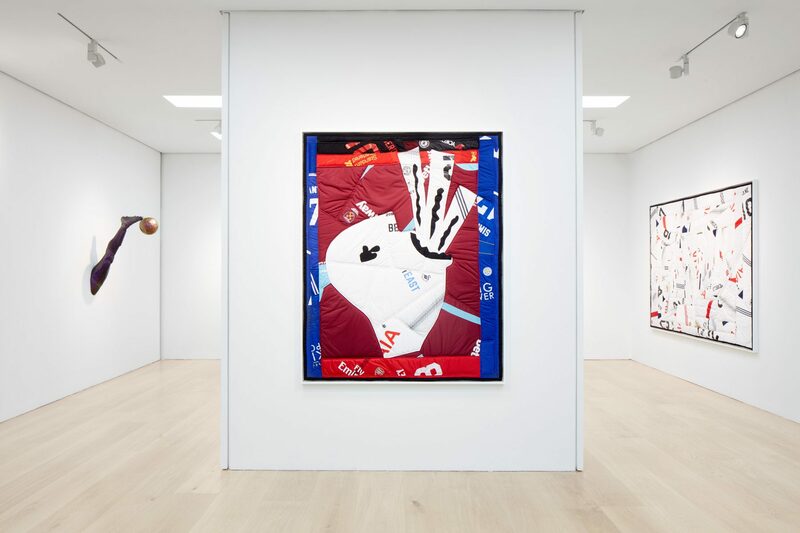 Hank Willis Thomas’ ‘The Beautiful Game’ explores the intersection of art, sports, geopolitics, and modernism’s debt to traditional African art. 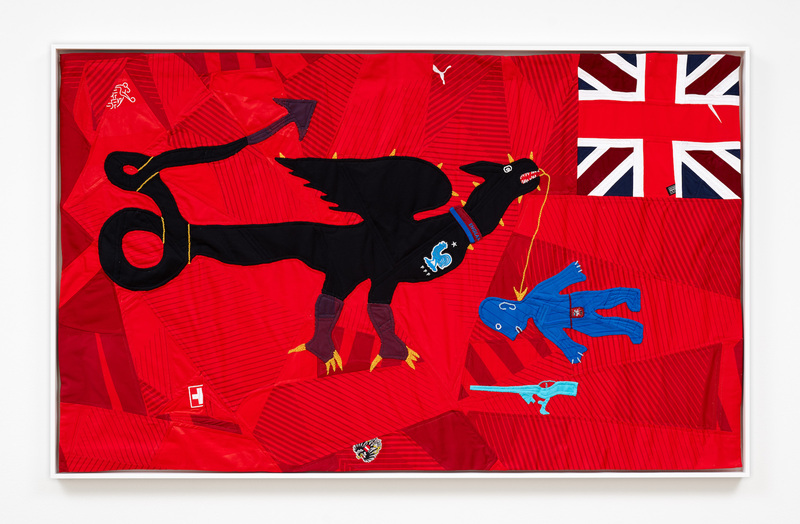 The body of work—quilts made from football jerseys—reproduces iconic works of art by Matisse and Picasso as well as Ghanaian Asafo military company flags to demonstrate the significant overlap between modernism, nationalism, colonialism, and human nature across time and culture. We spoke with Hank to learn more. I’m an artist and I grew up in New York. My mother’s an art and photography historian so growing up, I was always surrounded by art. I’m a person, a person trying to get it right. I'm a work in progress. I don’t believe in the separation between art and life and I think definitions are quite limiting… although they can be helpful in pointing to a direction. I feel that other people are better at defining those things. How did you discover traditional African art? Even though I’ve been to Ghana, well just once, I was not particularly familiar with Asafo flags. 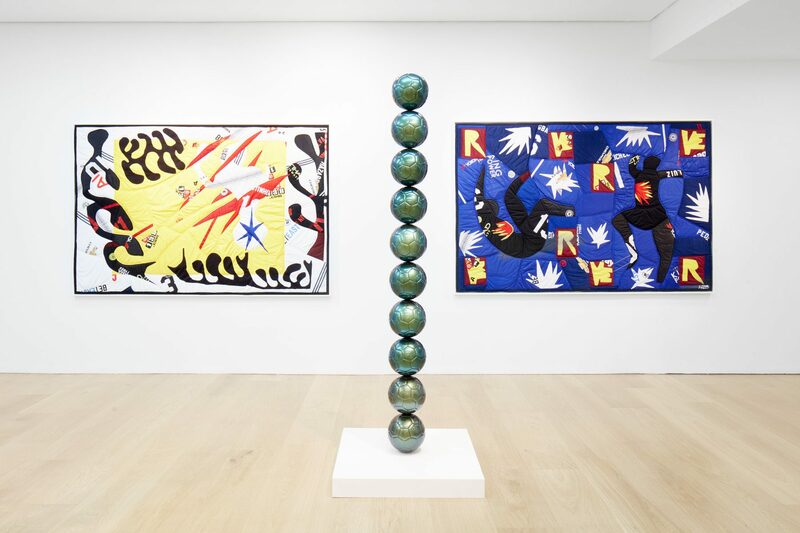 I’d seen them before in museums and in different people’s homes but I really became interested in them when I was looking at Matisse cutouts and his jazz book. Something in those images triggered a memory, “oh I think I’ve seen something like this before”. 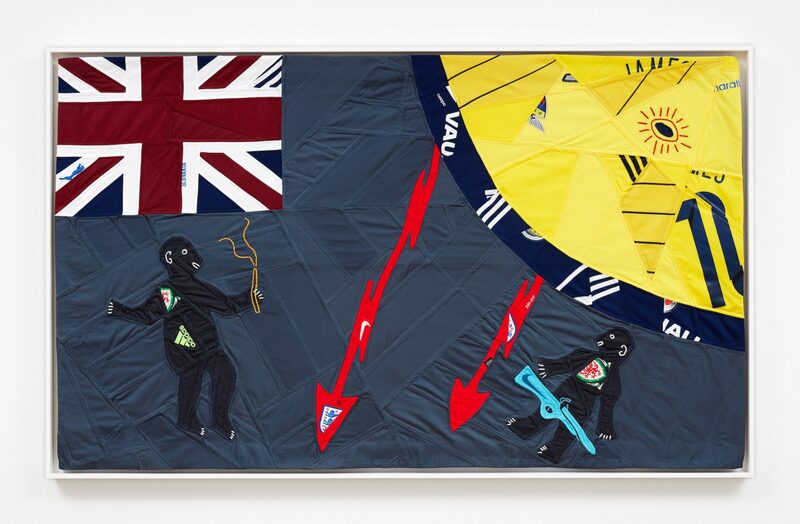 That had me go back and look at Asafo flags again and start to realise the ways in which traditional African art has directly influenced artists in the West. Tell us about your recent work, 'The Beautiful Game'; what was the inspiration behind it? I see the work that I make as asking questions. What is the influence of traditional African art and contemporary African art on western artists? What is the relationship between authorship and appropriation? How does mythology go both ways (because we see references to European mythology, like the dragon in certain elements of African art)? We see different proverbs that are related to globalisation, transnational trade, and technology in the Asafo, so is it traditional or is it modern? Where does performance fall into that? By adding a reference to sports jerseys, I’m asking what the link is to tribalism and to our military instincts as a species. 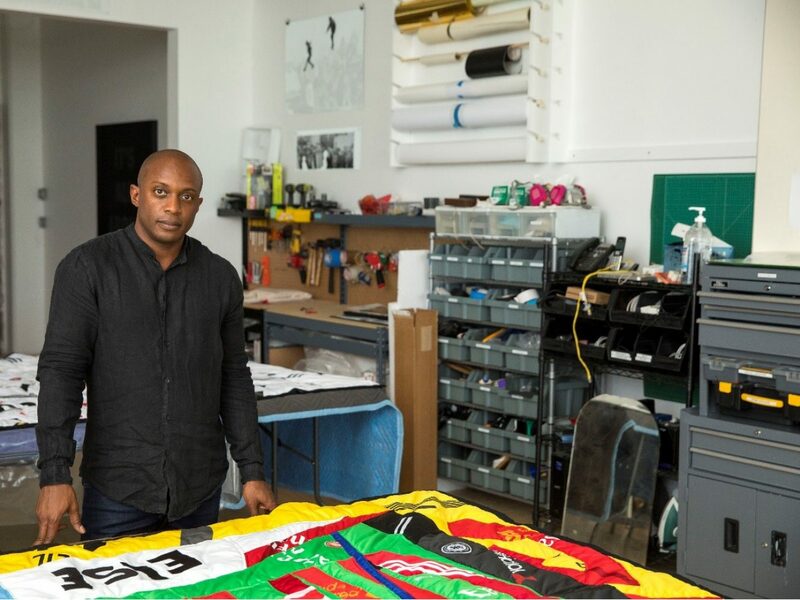 The jerseys also speak to sports as an accelerator to global commerce, cultural hegemony, and migration. A lot of questions. What was it about Asafo flags that struck you? How did you choose flag elements to incorporate into your work? I think that they were clearly telling stories, stories that I didn’t have a personal reference to. But they also felt modern. It's not like a lot of other early 20th-century African art. Most of what we see does not reference the modern. Something that came up for me is the lack of presence of African art in the contemporary art discourse. Realising the appropriation of traditional African art in the work of Western artists and vice versa. Many of the seamstresses and designers who made Asafo flags appropriated Western military heraldry as a way to communicate and exalt power. But also, of course, at the same time, Western countries were appropriating the land, material wealth, and people of the Gold Coast. Additionally, around that same time, with artists such as Marcel Duchamp, the notion of appropriation in Western art became an idea of the ready-made. This audacious claiming of other people’s things kind of runs throughout art history. That was a gesture I was trying to mimic in various ways with ‘The Beautiful Game’. What are you defining as ‘appropriation’ and how is that different from ‘influence’? What if I don’t see the need to define them? What’s the difference, I don’t know. I feel like ownership is a very Western idea. Who has what and what belongs to whom is a temporal question—all of our lives are temporary. But I also see ownership as a concept, it IS conceptual art. That’s why I bring Duchamp and colonialism into the conversation, it is an abstract idea that one can own, that I can possess something that is not of my body. "At the root of it this proposal asks, if African artists were also early modern artists, and modern art is conceptualism and abstraction, does it then mean that contemporary, modern, and conceptual art should be seen under the umbrella of African art?" What has been the reaction from collectors of your work? Has it exposed them to traditional African art? I feel like the conversation’s only just begun. People have embraced them on a certain level but the work also needs to grow. 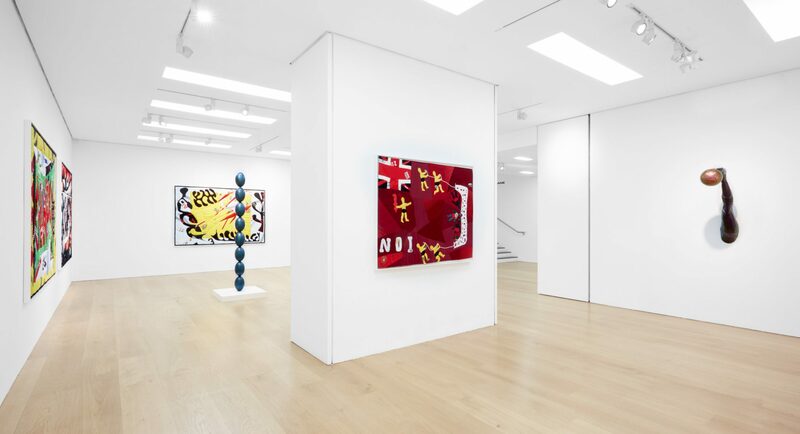 I show my work alongside Matisse and quilts by Stuart Davis because, although we know the names of these American and European artists, we don’t know the names of the African artists. But they were all working in the same tradition. I’m trying to do more work to draw those connections, to show the clear references. Both Matisse and Stuart Davis were inspired by jazz which is African American music but rooted in African music. And then there was jazz on the Continent happening at the same time too. There’s a lot to unpack, a lot of new questions to pose, and new people to bring into the conversation. Viewing the work, everyone’s a little bit like ‘wow’. Many are trying to understand where to place their feelings around the things they see. Some ask questions that I can’t answer about specific companies and specific events in Ghanaian history. That’s part of what the work is trying to provoke. I think great art asks complicated questions, rather than the very simplistic ones we’ve grown accustomed to. I hope people are not as quick to frame early 20th-century and 19th-century African art as being excluded from the discourse of their contemporaries in Europe who they were clearly influencing. African artists were in modernity. They weren’t not engaging with the rest of the world but they weren’t creating for consumption. Seeing Asafo flags on walls and frames, that’s not what they were made for. Time and movement are really critical and important elements to the many forms of African art. That’s why I see the relationship to cubism because cubism, dadaism, and surrealism are all a question of time. They are wrestling with the same ideas. That’s why I think it’s so necessary to make these connections.